GBC's revolutionary ProClick binding style provides users a whole new option in book binding that allows easy editing of reports and presentations. The revolutionary new spines used with this system are designed to work with a 32 hole punch pattern (3:1 pitch) and simply snap close and zip open. This means that presentations or proposals bound with this binding style can be easily edited in the field by sales representatives in order to customize or modify proposals or documents. Here at MyBinding we carry the full line of GBC Proclick equipment and supplies including the P50, P210E and P75. Plus we even carry options for spines that you won't find anywhere else. Check out the items below and feel free to contact us if you have any questions. Punching Capacity: 15 Sheets (20lb Bond) Per Punch. Welcome to MyBinding video. Small or large, the GBC ProClick Binding Systems are a great setup. And at MyBinding.com, we have them all. They’re simple, stylish and very easy to use. The P75 is an all-manual unit that was created for on-the-go publishing. It packs in your bag and processes book after book. The P110 and 210E come in both manual and electric. They are standard that have recently been overhauled. And the granddaddy of them all, the P3000 does everything for you all in one machine. 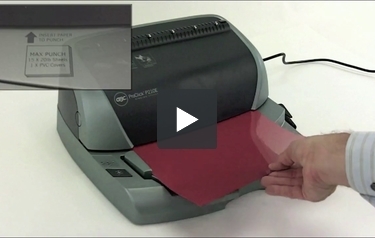 The LCD screen walks you through step-by-step in a perfect, easy process. One of the greatest selling points for ProClick is its ease of editing. Simply unzip and rezip; that’s all there is to it. We have all the machines and all the supplies. Give us a call and we can help you find the right one. MyBinding.com.